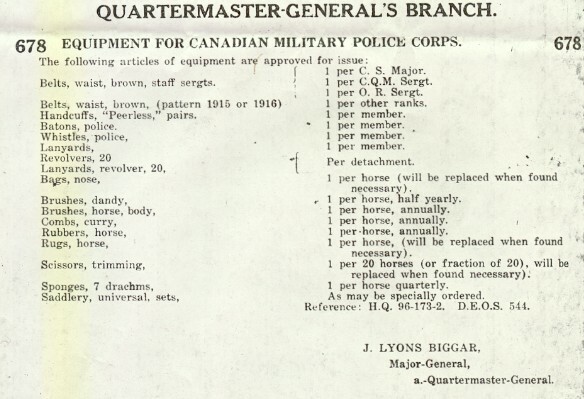 ��During the First World War, Canadian Military Police were issued a wide variety of equipment of Canadian, British or American origin. Until the formation of the Corps in 1918, there does not appear to have been a standard scale of issue. However, on the 15th of June, 1918 CEF Routine Order 678 specified the equipment to be issued to the newly formed CMPC. The police whistle was required to be carried at all times when on duty. It was the primary means of attracting attention or summoning assistance. If attached to a chain, the chain was hooked to the top button of the jacket, passed through the second buttonhole and into the left breast pocket. 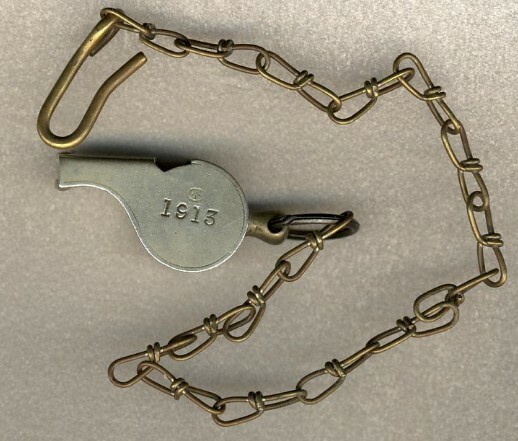 If the whistle was issued with a leather strap instead of a chain, it was hooked to the second button. Khaki whistle lanyards were also issued, worn looped around the shoulder. The illustrated whistle is the "Metropolitan" Brand, manufactured by J. Hudson & Co. Barr Street Hockley, Birmingham England. Introduced in the late 1800's it was very popular with British civil and Military Police. It is fitted with a leather strap marked with the "C Broad Arrow" denoting Canadian military property. This pattern of whistle strap was still in use in the Canadian military in the 1960s. It is possible the illustrated example dates from the Second World War. The illustrated whistle is similar to the above pattern, also made by J. Hudson and is dated 1911. 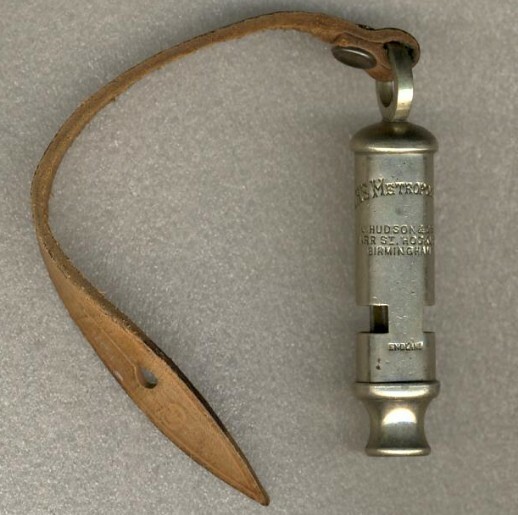 The "Acme" whistle made by the Hudson Company was the original design for the famous ACME THUNDERER whistle of the 1940s - 1970s. Dated 1913 and Canadian military property marked. 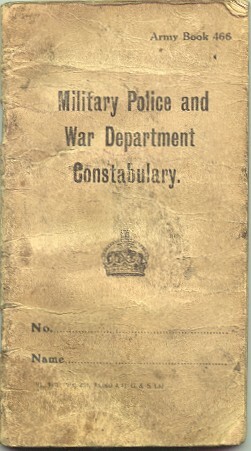 ��Another essential item was the Military Police notebook, Army Book 466. It was normally carried in the right breast pocket, along with a pencil. As with modern practice, each page was to be numbered consecutively, and pages were not to be removed. Errors were to be crossed out with a single line, initialed and dated. Military Police were instructed to make accurate notes, as soon as possible after an occurrance: "I Was..., I Saw..., I Did..." Where possible, entries were to be made in ink to prevent alteration or removal. ��Handcuffs were not normally carried on field duty, but were carried on town patrols, spare sets were stored at the Military Police Detachment or guardroom. A wide variety of handcuffs, leg irons and other restraints were employed on unruly customers by the Military Police. ��Handcuffs employed by the CMPC were of British or American origin. Illustrated above is a Canadian Military marked Peerless First Model Handcuff, made by Smith and Wesson. 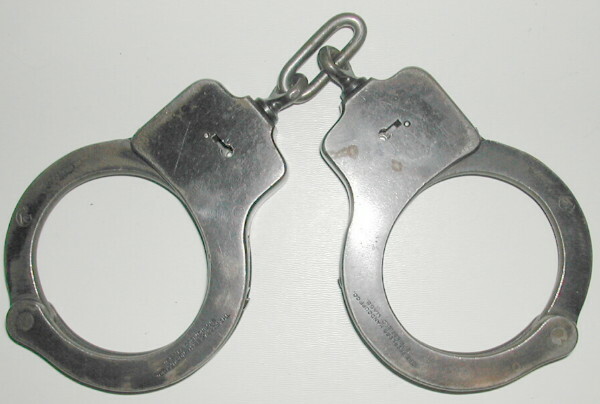 Other handcuffs known to be issued to Canadians were manufactured by the firms of Tower and Hiatt. A pocket knife was issued to all members of the CEF. Made by various manufacturers, they were similar in design, consisting of one or two blades, a can opener and a marlinspike. The illustrated knife was made by Thomas Turner & CO, Sheffield England. It is marked with the C Arrow and Militia and Defence property marks and is dated 1914. Some knives were made with wood or leather grips. 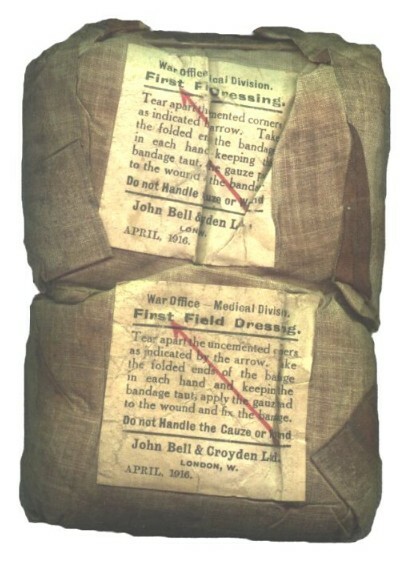 Two Field Dressings (bandages) were issued, intended to be carried in a specially designed pocket on the inside of the tunic. Hand held "electric torches" or flashlights were a relativly new innovation, coming into use just prior to the turn of the century. 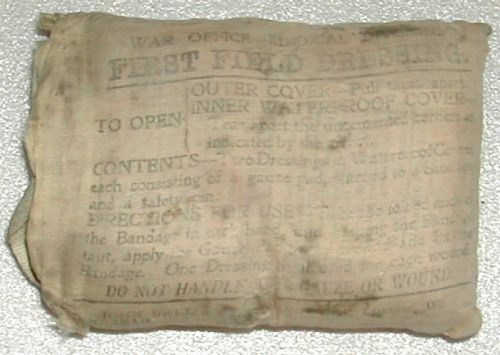 A number of commercial patterns were purchased privately by officers and there were several official issue patterns. The above illustrated "Torch, Electric" is British made, Government Broad Arrow marked and dated 1917. 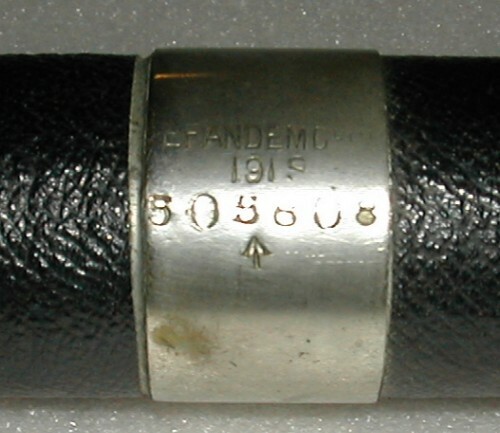 A similar military issue flashlight made by "EFANDEM Co Ltd" in 1919. Government broad arrow marked and serial numbered, it is fitted with a belt clip. Length: 11 7/8 inches (30.6 cm). In modern parlance, the police baton, billy, or truncheon is a "less lethal weapon". Before the introduction of chemical weapons such as mace and "Conducted Energy Weapons" (Tasers), the baton bridged the gap between the use of the policeman's fist and his firearm. The police baton is made of turned hardwood and has a leather thong or cord wrist strap. The general design has not changed since the Victorian era. Short batons were made to fit in the hip or jacket pocket, longer batons known as "nightsticks" or "riot batons" were carried ready in the hand with the loop around the wrist. There were dozens of patterns in use by the Canadian and British military, many being locally made or acquired. Painted brown hardwood baton with a leather wrist strap secured by a brass rivet. Length is 12 3/4 inches (32.4cm).